UAB "Automatizacija" designs, manufactures and installs control and automation components for the company manufactured and installed equipment as well as equipment purchased from other manufacturers. All management automation components can be made with an installed telemetry units. Telemetry unit allows users to monitor device status in real time from any computer with Internet access. Control system for electric motors operate pumps pump with one, two or three pumps. Control system ensures pumps 2 pumps work alternately after each cycle and a parallel between the two pumps work at a maximum debit and switch to a separate pump manually. Built-in protection against phase loss, phase change of direction and phase distortion, light alarm on each of the pumps on, the state of emergency, the service level and the level of emergency. 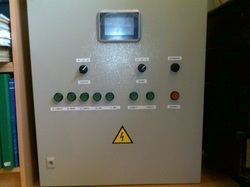 pump control panel, automation panel-mounted metal housing, protection class IP65, suitable for outdoor installation.